Homemade Window Cleaner, Glass, Mirrors and Eyeglasses too. A homemade window cleaner is, not only simple to make, but using it will save you money and save you and your family from being exposed to the harmful ingredients in many commercial window cleaners. Click here to learn more about the benefits of avoiding most commercial cleaning products. These homemade window cleaners can be used, not only on windows, but also on mirrors or any glass surface. I have also included here information on cleaning your eyeglasses. Use Old Newspapers: Crumple up a piece of old newspaper and use that instead of a cloth for a much shinier streak free finish. Razor Blades: For hard, stuck on messes, pour some castile soap over the mess and use a razor blade to slide over the surface removing stuck on debris. 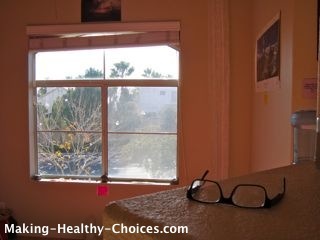 Sunshine: Avoid cleaning windows when the sun is shining directly through them, the warm glass will dry too quickly leaving streaks. This homemade window cleaner is so simple and inexpensive to make. Mix water and vinegar in a spray pump bottle and label. This can be made ahead of time and kept for later use. If you have a large home, mix up a few bottles and keep them in different areas for easy access. We keep one under each bathroom sink to clean bathroom mirrors and one under the kitchen sink to clean all other windows and glass surfaces. 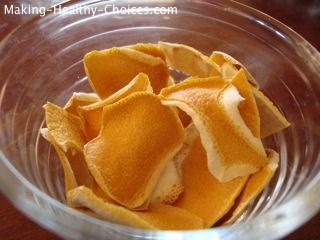 Every time we use lemons I save the peels and dry them in the sun or in our dehydrator. Add a few of the lemon peels to the above 'Basic Window Cleaner' recipe for a nice lemon scent. This has an added bonus as the lemon peels will give your homemade window cleaner some extra antibacterial qualities. For an even better boost of lemon, steep the dried lemon peels in white vinegar for a week then strain. This will give you a lemon scented vinegar that you can use in the 'Basic Window Cleaner' recipe instead of plain white vinegar. Instead of lemon peels, you can also add fresh lemon juice (1tsp for every cup of water used). 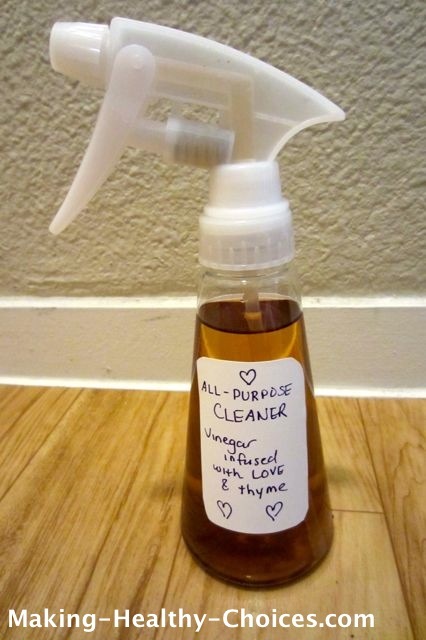 This all purpose cleaner is great on so many things including windows. You can dilute this 4:1 with water but I like to use it full strength - the smell is wonderful!! Yes, even your eyeglass cleaner contains harmful ingredients. And it isn't even necessary, all you need is a little water and a good cloth. Put some water in a fine mister spray bottle. Use a little bottle if you want to carry it around with you. Spray a little mist of water on your eyeglasses and use the microfiber cloth to clean. Allow your cloth to dry before putting it away. Castile Soap is a vegan soap made from the oils of plants. It is extremely mild and contains no harmful ingredients. I usually buy Dr Bronner's unscented organic pure castile soap which can be found at most healthy grocery stores or shops. For my recommended online source to buy castile soap, click here.